Lasya is a cheerful 7 year old girl and the first child to the Shetty couple. She had her first fracture in the 4th month while her body was being oiled. Like most of the couples whose children are diagnosed (with much difficulty) with OI, her parents had no clue as to what could have led to the bone breakage. 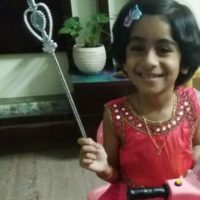 After a series of fractures in early childhood, multiple and various doctor visits and a lot of anxiety, it was diagnosed that Lasya had Osteogenesis Imperfecta. Naturally, what ensued after the diagnosis was a sense of disbelief, then a resistance and finally the acceptance. The journey has obviously not been easy for the family but they have decided to become more informed about OI and to create a fulfilling life for their child. In the process, they have experienced a number of challenges, moments of despair but continue to hold their head high. In a candid conversation with the Shetty family, IOIF got to know about various issues that a family faces which also echo challenges related to OI in general. The prime and the first concern that often springs up is the difficulty associated with the detection of OI. Given that there are more than 7000 rare diseases in India in addition to the widespread and commonly known health disorders, it can be extremely tough to diagnose them. Increasing instances of rare diseases prevalence and their cumbersome detection signal the importance of developing physicians especially trained to handle the cases related to rare diseases in India. 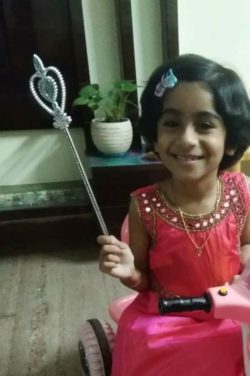 A diagnosis of an unheard disease can be emotionally taxing for the parents of the child therefore, as Sowmya, Lasya’s mother, had emphasized that parental stress in such situation is real and calls for suitable counselling services. 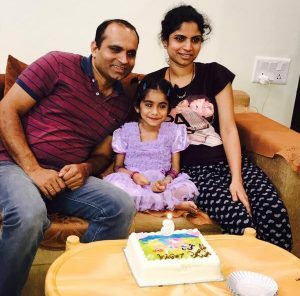 Lasya with her parents Rajesh and Sowmya. Sowmya also told us about the difficulty they faced while enrolling their daughter in the academic schools. Most schools were not willing to accept Lasya after getting to know about her health condition. However, due to the consistent and prolonged efforts of her parents Lasya has finally been enrolled in a school close to her home. She and her mother go to school together, she attends her classes and also writes exams. Sowmya and Rajesh (Lasya’s father) have taken major responsibilities to ensure that their child is educated in the best possible way. It is no surprise then that Lasya is the top rank holder in her class. We asked her how does she finds school, she smiles and says that she has friends there. It is often taken for granted what studying in a school can do to young minds until the horror of not getting the opportunity to study strikes upfront. In fact, inclusion, a principle heavily quoted in theory but seldom practiced widely needs more traction. This traction can be built by sensitizing our community collectively about rare diseases, be it parents, teachers, faculties, young children and the like. Through this approach, rather than being seen as a task to be taken care of, children with special needs will be embraced as they are, treated with dignity and nurtured to become empowered individuals. Another concern highlighted by the family was the expensive care that OI entails. Given that the fractures happen recurrently, most commonly used treatment is rodding. Multiple rodding and replacement of rods as the child grows can wreak a financial crisis on the family not equipped to handle the demand imposed due to health care. This brings our attention to the need for financial assistance to families based on their economic sufficiency. Amidst all these happenings, Lasya comes across as a well-informed and mature kid. Having seen so much at a young age, she herself makes efforts to make life easier for her parents. In fact, Sowmya does not shy away from admitting that, “Lasya has made our lives easier”. Lasya walks with support in her legs and is still learning to walk. We asked her, “What her aim is in life?” Her answer was, “Money is not important, I want to walk”. This profound sentence coming from a 7 year old is a testimony to the fact that this kid has been living life at a very close range, keenly observing all events in her life. Therefore, it is our responsibility as a society to create life easier for them and not more challenging. Schools, public places, institutions of higher learning all need to understand that a child is not defined by their physical structure but by their thought process, dreams, ambitions and aspirations. It would be terrible to block young aspiring minds to come into mainstream and deprive the entire community of the magic that comes along with them. In essence, our infrastructure needs to become flexible and robust to include everyone ending the resistance and a helpless hostility towards anyone different from the mainstream. Referring OI patients to us. Supporting education of students with OI. Volunteering to raise awareness about OI. 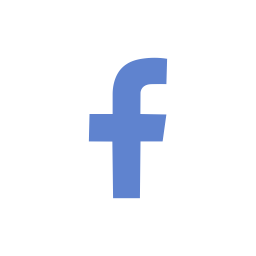 Sponsoring treatments for OI patients. Connecting compassionate orthopaedic doctors/surgeons with us. Organising awareness sessions in your communities and schools. Donate for the organisation's expenses such as educational material, honorarium for organising workshops, seminars related to OI.